“The Royal Society of Medicine offers the opportunity to advertise to a large, yet highly targeted audience of members and non-members, all of whom are actively engaged in the medical field and medical education. The support received by generous sponsors allow the RSM to invite expert speakers, reach a wider audience and offer reduced rates to trainees, students and other members. 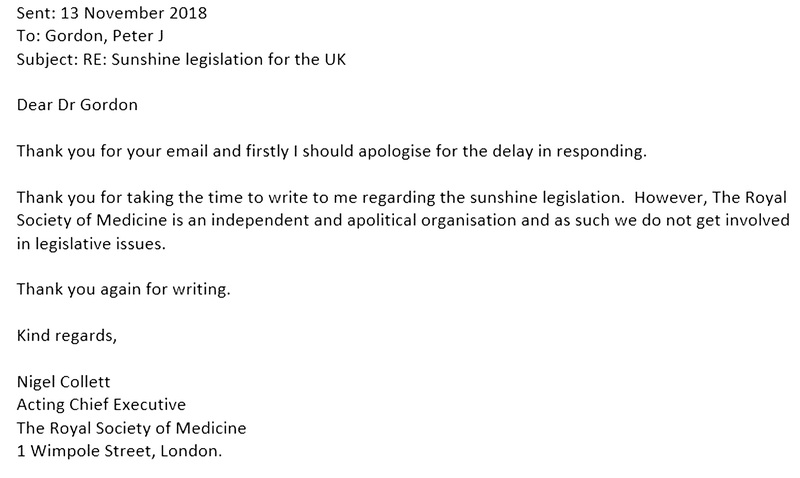 The RSM confirms that the conference that I asked about was organised by Pavilion Publishing who had hired the  Royal Society of Medicine venue at 1 Wimpole Street, London. It concerns me that the Royal Society of Medicine, which describes itself as "one of the country's major providers of postgraduate medical education" and that it is "independent", has no policy on competing interests. However it "expects" speakers to declare "any competing interests" which are then "included on meeting materials for delegates". This approach is similar to that taken by other Royal Societies and Colleges, and is far from transparent. The information given to delegates is rarely open to the public, is not systematically recorded, may not be archived and does not include the size or scale of any competing financial interests. The lack of public transparency by the Royal Society of Medicine means that there is no way for a patient to establish the role and scale of marketing in the advice provided by any healthcare professional associated with "one of the country's major providers of postgraduate medical education" in an event like this. Evidence has repeatedly demonstrated that exposure to industry promotional activity can lead to doctors recommending worse treatments for patients. In the UK the pharmaceutical industry pays at least £40 million each year to doctors for promotional and marketing their products.